Young Muslims across Jordan stood guard to protect churches on Easter Sunday so that Christians could celebrate the resurrection of Jesus Christ in peace. Just a week after 45 people were killed and over 120 were injured in Islamic State-claimed suicide bombings at two Coptic churches in Egypt on Palm Sunday, The Jordan Times reports that Muslim youth across the Sunni kingdom banded together to defend their Christian neighbors as they worshipped on one of the holiest days of the year for followers of Christ. 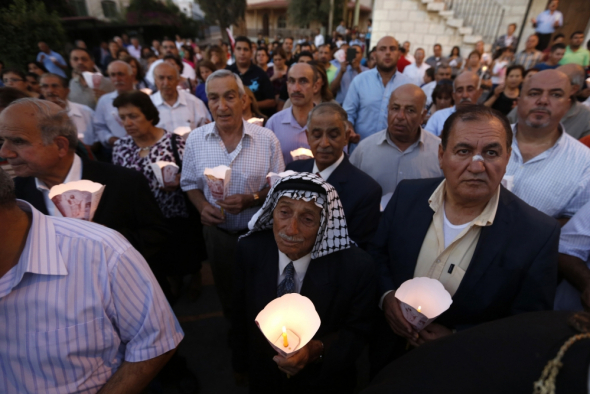 Although there were no known direct threats to Jordanian churches this Easter, the kingdom, which borders both Iraq and Syria, ranks as the 27th worst nation in the world when it comes to the persecution of Christians on Open Doors USA’s 2017 World Watch List. According to TeleSUR, Kazem Kharabsheh was one of the organizers of the initiative in Balqa and posted a call on his Facebook page. “Sunday night will be our fellow Christians praying in their churches [and performing] religious rituals. Some Mercenaries [are] threatening to our internal security and trying to intimidation from entering churches, as in Egypt the other day,” a translation of Kharabsheh’s Facebook post reads. Balqa was not the only region where Muslims in Jordan stood guard on Easter. According to Saleh Abu Mahfoud, who lives in the Zarqa governorate, he and other activists were willing to protect churches in their area. In the city of Madaba, Hazem Al Fouqaha explained that many Muslims in the town were going to stand guard in front of local churches to protect the Christians. Hala Saadi, a resident of the nation’s capital of Amman, told the Times that it is “sad to see such security measures taken out of necessity” in her home country. Jordan, which is part of the United States-led coalition to defeat IS, has beefed up its border patrol in recent months out of growing fear of attacks by the jihadi death cult. IS claimed responsibility for an attack on the Jordanian border with Syria last June that killed seven Jordanian members of the border security force. Additionally, IS barbarians released sickening footage in early 2015 showing a captured Jordanian pilot being burned alive inside of a cage. Jordanian Muslims aren’t the only Muslims who’ve put their lives on the line to protect or save their Christian neighbors. According to BeliefNet, three Muslim female police officers died while trying to save the lives of Christians who were attacked in the Palm Sunday church bombings in Egypt. In December 2015, Muslims in Kenya reportedly shielded Christians when the Somali terror group al-Shabaab raided a bus in the town of Mandera. In another show of solidarity from October 2013, over 200 Muslims in Lahore, Pakistan, formed a human chain around Christians as they gathered for mass at St. Anthony’s Church two weeks after the twin bombing on a Peshawar church killed over 100 people.